FUE Hair Transplant stands for Follicular Unit Extraction Hair Transplant. The hair follicles come in strands of one, two, three or four hair units that are rooted together. At SpaMedica we have specialized machines to extract healthy units of hair follicles which are grafted and implanted on the balding sites. FUE (Follicular Unit Extraction) hair transplant is more comfortable, eliminates concerns about scaring and allows the hair to grow more naturally in the transplanted space. The words follicular unit come from the embryological way that hair actually grows. The natural pattern of hair on your scalp is in what are called follicular units. We offer FUE Hair Transplant and Restoration at our clinic, SpaMedica, located in Yorkville, Toronto, ON. Our hair transplant team are experienced hair specialists and are guided by the expertise of Dr. Mulholland. Your hair restoration journey is comfortable, safe and overwhelmingly positive with SpaMedica. View SpaMedica’s Guarantee. Genetics determine the way a hair shaft grows in relation to its bulb or root. The follicular units can be harvested in singles, doubles, triplets and quadruplets, which are rooted together in a single bulb unit. Harvesting the extracted follicles ensures that genetically related hair families stay and grow together leading a potentially more natural growth pattern when transplanted to the recipient site. The most advanced and modern way to undergo FUE hair transplant is to harvest the hair from the back of the scalp, which is the preferred donor site, using the latest in automated and robotic tools. Robotic FUE harvest technologies; Artas® Hair Transplant and NeoGraft® Hair Transplant, are the fastest, most accurate and efficacious way to harvest hair without a linear scar. It is important to recognize how different and improved this strategy is compared to the alternative, which is the older and more traditional strip graft technique – which causes more pain and scaring. Good candidates for FUE (Follicular Unit Extraction) Hair Transplant are those individuals that desire no linear scar at the back of their scalp and have either genetic hair loss or a post-traumatic hair loss. Good candidates should also have a realistic expectation for the outcome of the hair transplant and restoration procedure. Candidates can include both male and female who are experience patterned-baldness and hair thinning. Patients who seek FUE hair transplant are advised to wait until they are at least 25 years old when the hair patterns are more predictable. Patients can expect to spend the entire day at surgical center undergoing their FUE transplant procedure. We recommend you bring your iPod and earbuds for auditory entertainment. The FUE hair transplant procedure is divided into two parts. The first part of the day involves extraction from the back of your scalp, an area called the occiput and temporal regions. This part of the procedure takes approximately four hours, it varies depending on the number of FUE grafts that are required to establish and restore the hairline and hair density to reach your goals. During this procedure, you are comfortably semi-reclined in a massage chair, similar to the type of chair you might see at an airport massage center or in a shopping mall. Following the Artas robotic harvest of your 4, 3 and 2-hair follicular units, you then lay completely flat on your stomach on a massage bed with your face resting comfortably inside the doughnut while the NeoGraft automated FUE hair transplant system is used to harvest the more delicate small single-hair follicular units and double-hair follicular units that are going to be used for your frontal hairline restoration. The SpaMedica FUE hair transplant technique deploys what is called a “stick-and-place”, a methodology perfected at SpaMedica using automation. It results in the densest, most natural-looking hair that you can achieve. In the stick-and-place technique, a small hypodermic needle creates a small slit between your recipient hair, or along the balding frontal hairline, and as the needle is removed, the graft is inserted. This process takes approximately 2-4.5 hours, depending on the number of grafts that need to be placed. Thus, when planning your hair restoration at SpaMedica, Toronto, using the Artas robotic and NeoGraft, one should plan for an 8-10 hour day, depending on the number of grafts needed and placed. A contraindications to FUE hair transplant would include autoimmune or inflammatory conditions that led to the hair loss as well as patients who have unrealistic expectations, additionally individuals who may be pregnant at the time of the hair transplant and restoration procedure or have open sores, lesions or cancerous growths in either the donor site or the recipient site. Our team, at SpaMedica Toronto Hair Transplant Clinic, is skilled at using the NeoGraft and Artas devices to create an efficient, painless (once the local anesthesia is injected) experience. The injection of local anesthesia naturally comes with some mild to modest discomfort, but a non-steroidal anti-inflammatory and oral relaxation medication is given prior to the FUE hair transplant procedure (one of the reasons you come early) will induce and facilitate a relaxed state for the transplant. The initial recovery of FUE hair transplant and restoration involves the first two to three days. During these two to three days, a soft dressing is used to cover the very tiny 0.9 to 1.2-millimeter donor site extraction holes at the back of the scalp. This dressing is in the form of a wrap that goes around the front of the forehead, securing the bandage over the back. It is important to note again, there is no cutting, or sutures used during the hair transplant procedure. The hair implants at the top of the head are left open to the air. You return the following day to have your wrap removed and a new dressing applied. One or two days following that, the dressing is removed once again and this time it is left off (usually by day 3). At this point, you’ll be shown how to gently wash and shampoo both the donor site and recipient site. By the third day, you can start to wear a baseball hat; however, it is important that this baseball hat only contacts in the back of the scalp and just above your eyebrows, with no fabric touching the actual transplanted hairs. The transplanted follicular units, if traumatized or touched by the fabric of a baseball cap, could become dislodged, fall out or die. The second part of FUE hair transplant recovery occurs between days 3-12. During this next 7-10 days, the stubble at the back of your scalp, where the follicular units were harvested, grows out to the point where you can no longer see the tiny 0.9 and 1.2- millimeter holes at the back of your head. At this point, if you have relatively long hair at the front and sides of your scalp where the hair restoration was performed, you will not need to wear a baseball cap, as the moderately long hair you have at the front, temporal and mid-scalp will hide the transplanted hairs. However, if you have short hair at the front and side, you may need to wait two weeks following the transplantation until all the scabs have fallen off until you’re able to return to work. Most patients are able to return to work in 7-12 days, depending upon the nature of their job. Thus, if you wear your hair fairly short, it is important to schedule a vacation of ten to twelve days following your transplantation session till you return back to work. If you are a male with male-pattern hair loss that wears their hair relatively long at the front and temporal areas of their scalp, or a female with long but thinning hair at the front and very long hair at the back, generally one can return to work within 7 days. Once you have returned to work after two weeks, FUE hair transplant patients will experience 2 phase growth of the transplanted hair. It is important to note, that all patients are instructed to be patient and wait approximately 12-14 months until the full density and thickness of the hair restoration can be judged. In those twelve to fourteen months following your FUE transplant, you will notice a two-phase growth pattern. The first-phase growth occurs with those hair shaft implants that do not undergo a “shock hair” effect and just start growing almost immediately. Patients can expect that approximately 50% of their transplanted hair shafts, on average, will start growing within 3-4 weeks following the transplant and will become quite long within the first six months. For the other 50% of the transplanted follicular unit grafts, the hair shaft will often fall out along with the scab in the first 14 days. However, do not fear that the graft has died, because the hair bulb has survived and is still inside the scalp alive and well. Second-phase growth then occurs at 4-6 months where you feel another diffuse layer of stubble starting to grow. The second-phase growth takes another six months to get long, thick and dense. Thus, it is at 12-14 months, that the final result of your FUE hair transplant can be judged. At SpaMedica, you can expect the highest possible graft transplantation survival rates, the lowest possible transection rates and the lowest incidence of shock hair (telogen effluvium). Because the grafts are extracted from the preferred site at the back and sides of your scalp, and these are areas of your scalp that you are genetically programmed to never lose hair, the results of your hair restoration are permanent and lifelong. Patients are generally extremely happy with the results of their Artas and NeoGraft robotic and automated hair transplantation procedures. Our patients are well-selected and realistic, achieving over 85% graft survival rate, less than 4% transection rate and a very natural hair design that they are able to customize with the help of Dr. Mulholland. During your consultation, we will outline a program of hair restoration treatments that may be performed over 10-20 years that you may require from ongoing genetic hair loss. There is no specific maintenance required following your FUE hair transplant. Over 85% of the grafts will survive and less than 4% of the extractions are transected. By 12-14 months, you’ll get a nice hair growth and the hair that has been transplanted will grow permanently, as it has been extracted from the preferred sites at the back and side of your scalp that are guaranteed never to fall out. However, you may require more hair implants as some of your genetic hair on the top of your head thins and falls out. This is not maintenance, but simply re-densification therapy depending on your genetic needs. At SpaMedica, Dr. Mulholland understands that multiple sessions may or may not be required over the course of your life and he will always design the type of hairline and densification approach that could be sustained and maintained throughout your life. Patients come back multiple times for more hair transplants as needed. In general, up 10-15% of the donor site can be harvested at the back of the head in a single session, which usually means 3000-4000 follicular units. Over time, up to 50-60% of the donor follicular units at the back and sides of the scalp can be harvested and transplanted without the hair at the back of your head looking thin. This translates into 10-12,000 grafts that can be harvested and made available over time, to ensure your transplanted hair looks natural and thick. You can safely go back into the same donor site at the back of the scalp after three months. Wait 12-14 months to go into the same recipient site (to avoid inadvertent trauma to un-expressed transplanted bulbs), but other recipient sites can be implanted 3 months after the one before. There are other surgical options to FUE hair transplants. As discussed, the strip graft procedure is still commonly performed, but the strip graft and other surgical techniques have more aesthetic and functional disadvantages compared to the FUE hair transplant procedure. There are some non-surgical techniques that can be deployed, including topical minoxidil, topical growth factors and nutrients, as well as high-fluence, low-level light therapy and nutrient shampoos. 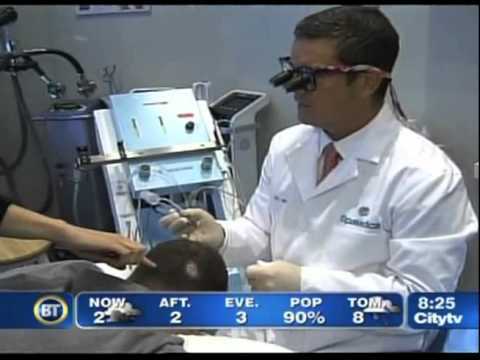 The SpaMedica non-surgical hair restoration procedures can be a popular place to start treatment for some patients, particularly young women and men, who often benefit from the SpaMedica combination program of laser therapy, topical growth factors, high dose, safe and effective 15% minoxidil serum and medicated shampoo. This non surgical hair restoration program uses a combination approach to non-surgical hair restoration as part of the SpaMedica postoperative FUE hair transplantation program and begins approximately two weeks following your hair transplant. Some individuals, particularly female patients, elect to start with SpaMedica’s non-surgical hair restoration program consisting of a home program of topical minoxidil, topical nutrient shampoo and six months of high-fluence, low-level light therapy, performed once or twice per week in the SpaMedica Yorkville clinic. This non-surgical hair restoration program is often quite successful in bringing back more diffuse densification for early female-pattern hair loss and also quite successful in male-pattern hair loss at bringing more hair into the anagen, or growth, phase from the sleeping phase, particularly in the male crown. It is important to note that, there is very little that non-surgical procedures can do to stop the progression of your genetic condition or thinning hair. Propecia, also called Proscar® or Finasteride, is an androgen-blocking, oral medication that can significantly slow male-pattern hair loss, but care should be taken in having this prescribed, as some patients may be at risk for a higher incidence of aggressive prostate cancer. Hair transplant cost depends on the number of hair grafts for the follicular unit takes place. The cost for FUE hair transplant cost starts from $4,999. At SpaMedica, the cost also includes the postoperative, high-fluence, low-level light therapy and nutrient shampoo. To schedule a consultation with Dr. Mulholland, call now and create the natural, thick, dense hairline and hair pattern that you desire.